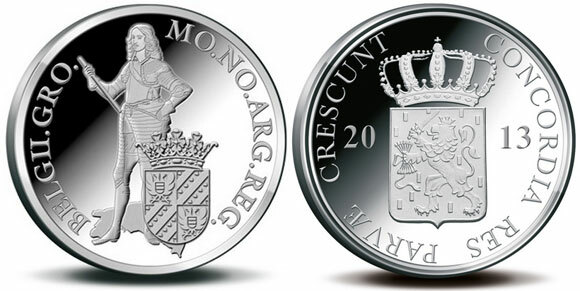 The Royal Dutch Mint have issued (21st October) their latest silver collector’s ducat, the second coin for 2013 in this ongoing bi-annual series, and this coin is dedicated to the Dutch province of Groningen. The northeasternmost province of the Netherlands, it borders the German state of Niedersachsen to the east and Drenthe to the south. The capital of the province is the city of the same name – Groningen. The province and its coveted city has been the source of many battles over its eventful history. The province joined the republic of the united Netherlands with the signing of the treaty of Utrecht in 1579. In 1647, Prince Willem of Orange, (depicted on the obverse) son of stadtholder Frederick Henry, Prince of Orange became Stadtholder of the province of Groningen among other provinces. Viceroy Willem worked for the restoration of his brother-in-law, Charles II, to the throne of England. He died in 1650 from smallpox, his young son Willem, prince of Orange would succeed him as eventual Stadtholder in 1672 and – as the husband of Princess Mary of England, went on to become King William III of England together with his wife as Queen Mary II in 1689. These historic coins and their modern examples continue to be minted in the Netherlands under the Dutch Coinage Act, which played an important part in the Dutch economy, especially in world trade from the sixteenth to the nineteenth centuries. The first examples of the one ducat coin were originally struck during the Dutch Republic (1581 – 1795). The new examples continue to be struck in the standard .873 silver fineness commonly used for this type of trade coin. The overall style of design of this popular series changes after all the Provinces are represented. The obverse of the coin features a standing portrait of Viceroy Willem II (1626 – 1650) in the armor of the anonymous knight. The coat of Arms of Groningen in the form of a shield is placed at the foot of the Viceroy along with an outline of the province itself, just behind the shield. The text “MO. NO. ARG. REG. BELGII. FRI” (Moneta Argentea Ordinum Foederati Belgii Frisia” is positioned above the primary design along the rim and divided into two sections of text. For more information on this and other coins offered by the Royal Dutch Mint, please visit their website at: http://www.knm.nl/Zilveren-Dukaat-Overijssel-2013/nl/product/3284/ Information is offered in Dutch, International orders fulfilled. How does one obtain this coin? If you cannot obtain the coin direct – do let me know and I will try to arrange a delivery from my office. I cannot obtain the coin directly as I am in the USA. Let me know if your office can arrange a delivery. You can send me an email if you can see my email from this posting. Otherwise give me a way to reach you outside of this webpage so we can further communicate the necessary information.